This article first was published on Seedstock.com on April 10, 2012. Researchers at Harvard School of Public Health have linked imidicloprid, a common agricultural pesticide to honeybee Colony Collapse Disorder, a mysterious phenomenon resulting in devastation of entire hive colonies. The dramatic decline in honeybees because of this phenomenon has worried scientists, farmers, and beekeepers alike, as honeybees play a vital role in pollination and fruit production in both natural and agricultural ecosystems. The results of the study were announced in early April in a Harvard School of Public Health press release and will be published in the June issue of the scientific journal Bulletin of Insectology. Florida beekeepers first reported the bizarre symptoms of Colony Collapse Disorder in the winter of 2006-2007. In 30-90% of beekeepers hives, the worker bees, or drones, spontaneously abandoned the hive, leaving behind their queen and their young. Without the workers to sustain the hive, the queen and young soon died. The phenomenon was like nothing beekeepers had ever seen before. “If the honey bees died because of pathogen infection or disease you would see many, many dead bees both inside and outside the hives,” says Chengshen Lu, HSPH assistant professor of environmental exposure biology and lead author of the study. In cases of Colony Collapse Disorder, beekeepers have not found any dead bodies inside the hive and very few near the colony at all. Lu says that he and his colleagues were able to replicate Colony Collapse Disorder in a study in Worcester County, Massachusetts. The study consisted of four bee yards, each containing four hives exposed to varying levels of imidicloprid and one hive left untreated as a control. After 23 weeks, all but one of the treated colonies collapsed. While those treated with the highest dose succumbed first, even those treated with low concentrations (smaller than the amounts used in agriculture) collapsed. Imidicloprid is a neonicitinoid, a class of pesticides designed to attack the nervous system of pest insects. Originally approved for landscaping in 1994, imidicloprid has since become one of the most widely used agricultural pesticides. Lu explains that when imidicloprid is applied to seeds, it will grow with the plant, finding its way into all parts of the plant, including nectar, pollen, and fruit. Bees foraging for nectar drink the imidicloprid-laden nectar and transport imidicloprid-rich pollen back to the hive. In the case of commercial bees, beekeepers frequently supply the hive with high-fructose corn syrup during winter months to extend honey production. (Lu and his colleagues used this same technique to administer exact doses of the pesticide in their study). Because much high fructose corn syrup is derived from corn that has been treated with imidicloprid, these synthetic feeds are also a source of poison for the fuzzy pollinators. Lu believes timing has masked the link between imidicloprid and Colony Collapse Disorder. In his study, the hives appeared healthy for months after exposure. 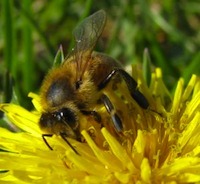 Twelve weeks after dosing, bees were buzzing around productively. He says that previous studies have looked for evidence of immediate toxicity. “If they don’t see an immediate problem, they wrap up the study and move on to the next,” he says. He adds that while understanding this delayed response brings a much-anticipated answer to one mystery, it begs an equally mysterious question: Why does it take so long for the poison in the imidicloprid to affect the honeybees? Lu says that the delay between exposure and symptom expression is longer than the life cycle of a worker bee, typically 30-40 days. “It takes a couple of generations to make the toxicity occur in a dramatic way.” That means that the bees that are dying are not the same bees that were first exposed to the poison. Lu aims to investigate this delay this year in an additional study. The EPA already lists imidicloprid as toxic to bees in high doses, but in the absence of evidence that chronic exposure could be harmful, still permits its use. Lu says that he has sent the EPA a copy of this study as a courtesy and hopes that it will encourage the agency to consider its recommendations. have these remarkable balcony railing planters to augment the originals. and slowly build the box higher, adding more dirt as the potato plant grows. bear weight or keep the boxes at all. to the fullest advantage for the homeowner. And his can be installed in probably on every part of the world. Photovoltaic cells have undergone several changes since they were first sold.